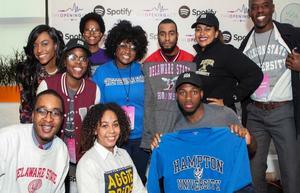 HAMPTON, Va. (September 7, 2018) – The Opening Act Roadshow from Spotify is coming to Hampton University and students are encouraged to apply for this 2-day experience for eager and talented undergraduate students interested in tech, music, and media industries. There are a limited amount of spots available and students need to fill out an application to be accepted into the conference. Applications are due September 9, 2018 at 11:59 p.m., EST. Eligibility criteria and the application can be found here: http://tinyurl.com/ydhrffz2. The Opening Act Roadshow HBCU Conference is a 2-day conference where students will have the opportunity to network, participate in workshops, and hear from Spotifiers and industry thought leaders to help them kick start their career journey. This conference, now in its third year of execution, is excited to partner with Hampton University for its first national HBCU visit. The conference will be held at Hampton University on Monday, October 1, and Tuesday, October 2, 2018. Students will get to see first-hand what a career path within the music, tech and media industries look like, and gain valuable insight into how to achieve their career goals. Spotify is a digital music, podcast, and video streaming service that gives users access to millions of songs and other content from artists around the world. Its headquarters are in Stockholm, Sweden. For more information, contact Dr. Cherise Bernard at 718.722.0981.